This page covers families in the maternal line of John's mother Emily May GUTTERIDGE. The narrative starts with John's great great grandfather Cuthbert HAMBLETON. See the EMBLETON Families page for earlier generations. On his marriage certificate and the census returns for 1871 and 1881, John's great grandfather is named as Henry HAMBLETON. He claimed to have been born in Middlesex abt 1832 and his father is named as Cuthbert HAMBLETON, nurseryman. Since his birth was before the advent of civil registration, we had nothing to suggest which parish registers to search. Neither were we able to find him on the 1851 census. We did know that he was married previously, but were not able to identify his first wife. After five years of searching, we happened upon the EMBLETON surname on a census return and wondered if it might be worth a try. To our surprise, we very quickly found Henry EMBLETON, eleven siblings, his first wife and three generations of ancestors. See the EMBLETON Page for full details. In 1870, Henry married Priscilla ELLIOTT in Shearsby, Leicestershire. By 1871, they had moved to Leicester where Henry was employed as a leather currier. 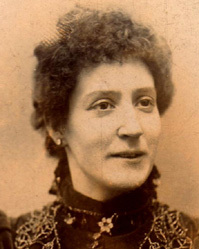 Their first child Priscilla was born in Birmingham in 1871 and their second child Alfred in Walsall in 1872. By 1881, the family had moved to Shearsby where Henry was employed as a leather currier. We believe the family subsequently moved to the Market Harborough as Alfred died there in 1888 and Priscilla married there in 1890. At that point, however, the trail goes cold as we have not been able to find Henry or his wife on the 1891 or 1901 census returns. We have, however, discovered that Henry and Priscilla died in the Union Workhouse in Northampton in 1909 and 1905 respectively. Priscilla was the eldest child of Henry and Priscilla HAMBLETON. In 1890 she married Thomas LOAKES in Market Harborough. They had at least four children - some or all of them born in Northampton. At the time of writing, the family has not yet been found on either the 1891 or 1901 census returns. Priscilla is known to have run a sweet shop in Northampton prior to her second marriage in 1911 to John's grandfather William Normanton GUTTERIDGE. They went on to have two children - John's mother Emily May GUTTERIDGE and her younger brother William. The family was living in Lower Harding Street when Emily was born. Priscilla died in 1949 at the age of 78. As described above, Priscilla's brother Alfred died in the Market Harborough area in 1888 at the age of 16. No other siblings are known.